The dry side of the 'bog garden border' this evening. Conspicuous plants are (L-R): Argyranthemum 'Jamaica Primrose'; Zantedeschia aethiopica (Sani Pass form); Tanacetum parthenium 'Aureum'; Ligularia 'Britt Marie Crawford'; Helenium 'Sahin's Early Flowerer'; Agastache rugosa 'Golden Jubilee'; Hemerocallis 'High Tor'; Viola cv; Lysimachia 'Alexander'. Lilium pardalinum form (given to me as L. occidentale). It has built up into a large clump in well enriched soil in partial shade. A new acquisition this year is 'Peach Butterflies', an Asiatic Hybrid. It is a lovely colour and has shapely flowers, but the plant is too dwarf, being only about 45 cm tall, and it is rather submerged among other things. of course I could plant with shorter things, but I suspect it's a plant that will always be difficult to place. 'Lady Alice' (below) is a magnificent, vigorous plant that from its flower shape and arching habit must have Lilium henryi in its parentage - and is just as amenable in cultivation. Every year I wish I had planted it so that it was adjacent to the Clematis 'Prince Charles' a few yards away in the same border: the colour combination would be delightful. I am aware that I haven't caught up with all the gardening things done and seen while I was in the USA, now over a week ago. To catch up here are a few snapshots from places visited. The overwhelming feature of the visit was the heat and humidity - I had not visited the East Coast at this time of year before. It was expected, but like entering a tropical greenhouse, the reality comes as a shock. But to this climatic feature, unknown anywhere in Europe, can be ascribed the success of so many plants that we find difficult or impossible to grow - the lotus (above), Lagerstroemia (see below) need it, and many magnificent trees are nurtured by it to statures undreamt of in Britain. To my mind, Chanticleer is one of the most exciting gardens in the world, a place it is always a pleasure to visit for its aesthetics, its philosophies, its people, and above all for inspiration in garden-making. Formerly the home of the Rosengarten family, Philadelphia pharmaceuticals manufacturers, it is now owned by the Chanticleer Foundation, with Bill Thomas as Director. Under his wing is a team of talented gardeners, each given the freedom to express their own gardening and other skills in their sectors of the garden, with the result that it is never static or dull. The trees (and gardens) on the campus of Swarthmore College are designated as forming the Scott Arboretum (Director, Claire Sawyer, Curator, Andrew Bunting). Including many truly magnificent specimens, they greatly enhance the attractive college buildings, largely built of finely grained grey stone, as well as providing an appropriate setting for the annual Woody Plant Conference. To the right is a fine American Elm (Ulmus americana), demonstrating the umbrageous crown that made the species so popular a street tree before the ravages of Dutch Elm disease, and so greatly mourned since. The Swarthmore trees are kept alive by regular injections of fungicide. The Woody Plant Conference was a hugely enjoyable day combining learning, entertainment and conviviality (the evening was particularly convivial). 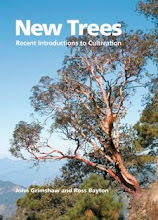 For me the highlight of the day was the talk by Prof. Gary R. Johnson from the Urban Forestry & Horticulture Research Institute of the University of Minnesota, about the dangers of planting trees at the wrong depth and from unsuitable containers - a problem shamelessly ignored by the nursery trade. More information on their work can be found here. The speakers were put-up in the College's guesthouse, a slightly gloomy and cavernous, but well-appointed nearby mansion. Outside it grows the finest Ginkgo I've ever seen, with a superb straight and thick trunk (well over a metre in diameter). The campus and grounds are well-stocked with trees from the familiar to distinctly unfamiliar, such as Alangium chinense, a member of the Cornaceae (below). The Scott Arboretum specimen is featured in New Trees so I was pleased to pay homage and see that it is thriving. It has a huge natural distribution covering much of Africa and Asia, and clearly appreciates the hot summer. Following my visit to Pennsylvania I moved northwards, to the Hamptons at the north end of Long Island, New York, where I was guest speaker for the Horticultural Alliance of the Hamptons on a very hot Sunday afternoon. Although the turnout was not large, we had an excellent interactive meeting - it is always interesting to learn about local conditions from local gardeners. My kind 'chauffeur' Guy Combes and I stayed with Ernest Cavallo and Arthur Thomson at their charming home in Water Mill, where big tubs of Agapanthus by the pool gave a very Mediterranean feel. Ernie took us around to get a feel of the opulence of the properties in the Hamptons - I have to say I have never seen so much conspicuous expenditure in one area. Or perhaps I should say, evidence of it, as the denizens of the Hamptons are very fond of concealing their mansions behind high privet hedges. But in one horticultural way it was evident, in the form of the specimen trees available in nurseries, for instant planting effect. This balled-and-burlapped Japanese maple was the most expensive one I saw with a price-tag (at Marder's, Bridgehampton), but one could have anything from semi-mature weeping beeches to large cryptomerias from the same establishment. The nurseries were full of well-grown, freely-flowering more normally sized, more normally priced plants. I was amused to see that Hydrangea paniculata 'Grandiflora' is generally known as PeeGee and also envious of the crepe-myrtles (Lagerstroemia) that, even in this cooler area, are widely grown for their summer effect. The cultivars available are now mostly hybrids between L. indica and L. fauriei, many of them having been developed at the US National Arboretum. All are hopeless in the cool British climate, alas. Lagerstroemia 'Dynamite' - the best red crepe-myrtle I have seen. Flowering here for the first time is Gladiolus longicollis, a dainty species from the summer rainfall areas of eastern South Africa. I know it as a grassland plant on the slopes of the Drakensberg, for example on the Sani Pass. There it is usually tossed about by the wind, and with its flowers furled for most of the day it is not easy to photograph. The flowers open wide, like this, only in the afternoon, when they release a strong sweet fragrance, presumably to attract specific pollinating moths. Their long floral tubes (below) suggested the specific name, and are adapted to being probed by long-tongued moths. G. longicollis is closely related to G. tristis, a more familiar species in gardens, that grows most frequently in damp places in the Western Cape. 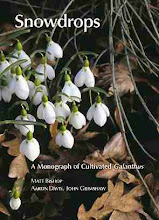 Although a winter-grower, G. tristis is moderately hardy in Britain and one imagines that G. longicollis should be even more so, should it be possible to build up sufficient stock to try it. I have one flowering corm and one with a solitary leaf from seed sown in 2003 - it has not been easy to get corms to survive and then fatten up. I grow it in the greenhouse during the summer, repotting in spring and feeding gently through the summer, storing the undisturbed pot totally dry over winter. After an almost unprecedented three days of non-horticultural activities it was back to normal last Thursday, with visits to two great gardens and culminating in dinner with an intensely horticultural crowd of speakers, garden directors and doers at Swarthmore College. First stop was Frog Hollow, Eve and Per Thyrum's garden in Wilmington, Delaware, a two acre site filled with good planting and sculptural whimsy - and lots of frogs. Even after 11 inches of (sometimes very heavy) rain in the previous week the garden was looking wonderful. As with many American gardens, it seems, much of it is quite shady, but a series of more open glades brings the sun in, providing opportunities for different effects of foliage and flowers. In the front garden, largely shaded, was an impressive collection of hostas with almost entirely unblemished leaves. To deter molluscs Eve waters them with a dilute solution of household ammonia before and around emergence: the results show the value of this approach. With them was a lovely diversity of woodland plants chosen at least as much for their foliage as for their flowers, including Viola 'Dancing Geisha' (right). A plant I had not seen before was Hypericum calycinum 'Brigadoon' (below), with golden foliage, very effective in dry shade. Between the plants, throughout the garden, are numerous sculptures. Some have been created by the inventive Per Thyrum, others represent local artists, such as this crane by Simple, stalking through a shaded bed. Eve grows an admirable selection of hardy cacti and other succulents in a sunny spot, but finds agaves difficult: these lead replicas by Dan Benarcik are the ultimate in hardy Agave! Last Wednesday my friend Guy Combes and I spent the afternoon on the Maryland section of Assateague Island, a long thin barrier island stretching across the state boundary to Virginia. It is effectively no more than a low ridge of dunes covered with vegetation in various successional states. The picture above shows a typical section of stabilised dunes with a conspicuous Juniperus virginiana with some Pinus taeda: elsewhere were woods of uniformly aged trees of this species. The island is not particularly botanically diverse, but there were a few interesting plants to be seen. To the right is a flower of Sabatia stellaris (Gentianaceae), which was growing in damp dune slacks. This oak, in uncharacteristic shape, appears to be Quercus falcata, which would normally be a straight-trunked large tree. Its identity is suggested by the comparatively poorly dissected leaves, which in some cases had only the apical and two other lobes, plus a softly hairy underside. Prunus serotina, known in America as the Black Cherry, though Black Bird-cherry would be more apt, is also usually a large tree, but on Assateague grows either as a bush or a small tree. They were laden with fruits, which are an important source of food for birds. There were lots of birds around, but without binoculars it was impossible to get clear views of most. Tricolored Heron in the marshes was a lifer for me, though - a handsome bird in grey, white and russet - and it was nice to see Brown Pelicans flying over the sea. I also enjoyed seeing a pair of Horsehoe Crabs pushing along in the debris of the tideline (below). Amazing prehistoric creatures, they featured in one of my first books as a boy, Marvels and Mysteries of the Animal World, a large volume published by National Geographic, so I've always been interested in them. Assateague Island is most famous though for its 'wild' horses, reputedly descendants of survivors from a Spanish shipwreck. They are abundant - in the Maryland sector of the island they are given contraceptives to reduce their reproduction rate - and far from wild in behaviour, grazing placidly by the roadsides and around campgrounds, or, despite stern warnings, being fed by tourists. A couple of pics are below. I got back from a most enjoyable week in the United States this morning - there are many interesting things to post about over the next few days - but here are a few plants looking good in the garden today. Asclepias purpurascens - a milkweed from the eastern United States. Unlike some, it doesn't spread by stolons, and is slowly bulking up to make a tight clump. This magnificent mullein is a hybrid between V. thapsus and V. nigrum, and appeared spontaneously in my parents' garden. It has inherited the purple anthers and branching habit of V. nigrum, but its height comes from V. thapsus. We are hoping that it will prove to be perennial like V. nigrum and that it can therefore be propagated vegetatively (most hybrid mulleins are sterile). I'm currently at the guest house of Swarthmore College, near Philadelphia in Pennsylvania, in preparation for the Woody Plant Conference held there today. I'm giving a talk on 'The Diversity of New Trees', alongside several other speakers covering subjects as diverse as root structure, forest management and the introduction of shrubs from the wild. The event is organised by a consortium of gardens in the area, but hosted by the Scott Arboretum of Swarthmore College. The plantings of the Scott Arboretum are located through the grounds of the college and include a wide range of trees, from magnificent natives to choice new introductions. In this climate of summer heat and humidity (thank goodness for air conditioning!) trees grow incredibly well. Outside my bedroom window is a superb Ginkgo, which must be at least 25 m and 120 cm diameter, and this is just one of many magnificent specimens on the campus. Unfortunately I can't upload pictures at the moment, but will do so as soon as I can. The wild flowers of the Cotswold roadsides have been fantastic this year, perhaps because in the prevailing dry conditions the grass has not grown so tall as usual and they are more visible. Travelling across the hills to lunch today the display in the verges was so beautiful I stopped to take pictures in several places. Here are a few of the results. Lady's Bedstraw (Galium verum) with Field Scabious (Knautia arvensis) and Great Knapweed (Centaurea scabiosa). To me Geranium pratense is the flower of the Cotswolds, beautifying the roadsides for mile after mile. This is an extremely elegant form of Cyclamen purpurascens, selected and developed as a seed-raised cultivar by the Dutch Cyclamen enthusiast Jan Bravenboer. It has a broad pewter marking in the centre of each leaf. It grows in the raised, humus-rich bed here, receiving full sun for much of the day at present. I wish it were possible to convey scent online: the fragrance of Cyclamen purpurascens is one of my favourites, a concentrate of Lily -of-the-valley. Another hot, dry, windy day here, so I thought I'd post a couple of pictures of the Colesbourne Park garden before the drought really begins to damage the summer display. The herbaceous border: the pink flowers are Malva moschata, the yellow daisies Anthemis tinctoria. In the background 'Rambling Rector' covers the pergola. The bog garden - something of a misnomer as most of this is a very dry bank, planted with big, bold drought tolerant perennials. True moisture-lovers, such as the Primula florindae hybrids and Zantedeschia) are at the water's edge. When lifting bulbs for chipping yesterday I unearthed this extraordinary specimen of Galanthus 'Natalie Garton', which is the biggest snowdrop bulb I've ever seen. It is composed of three noses within the tunic of the original bulb, but as they have not yet split away from the basal plate I think it is fair to regard it as one bulb. A normal G. nivalis bulb is alongside for comparison. 'Natalie Garton' is a robust supervolute with semi-double flowers. It has very broad leaves and some of us think it could be a genuine G. elwesii. It is named after the late Natalie Garton of Ramsden in Oxfordshire, who distributed it from her beautiful garden before her death in 1996. When I looked out at 5 am this morning I saw a flash of blue disappearing into the trees behind the garden, so I got the loo window open & waited. Sure enough, not long afterwards a Kingfisher flashed past my study window from the river, and round to the pond. It perched on the slabs and I shot a few pictures before it heard the shutter and whizzed off again. However, the auto-focus had concentrated very nicely on the clump of Pulsatilla in front of the bird, with the miserable result seen to the right. The main picture is of a Kingfisher sitting in exactly the same place in October 2008. There was much to see at the RHS Hampton Court Palace Flower Show on Tuesday, but I haven't much time to write about it. Here are a few pictures and comments on things that caught my eye. Disa is a remarkably diverse and numerous African genus of ground orchids, reaching its flamboyant pinnacle in D. uniflora from the Cape (seen in the foreground here). They have never been considered easy to grow, so this display by Dave Parkinson Plants was a tour de force in every sense and for me by far the most interesting stand in the Floral Marquee. Also of South African origin are the much more familiar garden Gladiolus. Several stands showed the familiar large-flowered cultivars, but I was glad to see that new breeding work is taking place with Pheasant Acre Plants showing some new smaller-flowered seedlings they have raised. This unnamed seedling is particularly nice. No horticultural show is complete without a stand from Dibleys. This was the side of their display featuring their begonias, coleus and other plants - there was an equally impressive show of Streptocarpus as well. The richness and diversity of colours and textures available in Begonia is compelling. A bold foliage display was produced by the Palm Centre's groupings of silver- and dark-leafed plants, with a stunning Brahea at the back. Fine foliage plants do not have to be tender rarities - the cabbage 'Kalibos'. The full ensemble of this group 'Hippo Wallow' from Suzie Marsh can be yours for £1635. They would look good emerging from duckweed.